Finally, David Stevens’ Some Corner of a Dorset Field That Is Forever Arabia gives us the secret history and fantastic death of a famous English colonel. I count this last as a jewel in CHTHONIC, and I think you will, too. When I first described my monster, I thought it was harmless enough, as monsters go, but then I saw Fufu Fruenwahl’s drawing, and it freaked me out on several levels. Hmm, there may be something wrong with me. If you enjoy reading the weird, and/or supporting small independent publishers, I recommend CHTHONIC for your reading and purchasing pleasure, with not a jot of self interest (you can trust me, I’m Australian). Martian Migraine Press presents seventeen diverse tales of subterranean horrors and abyssal wonder. 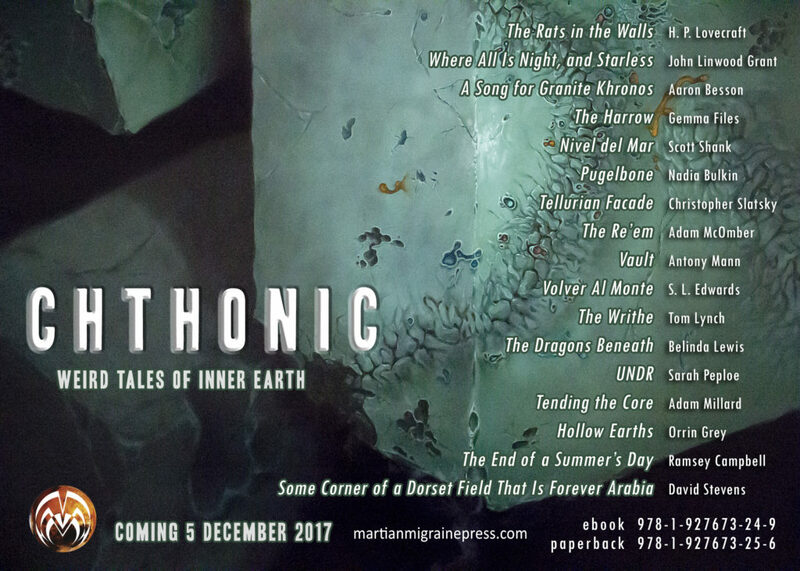 CHTHONIC: Weird Tales of Inner Earth features stories by Ramsey Campbell, Gemma Files, Nadia Bulkin, Antony Mann, H. P. Lovecraft, Aaron Besson, Christopher Slatsky, Adam McOmber, John Linwood Grant, Scott Shank, Sarah Peploe, Orrin Grey, S. L. Edwards, Belinda Lewis, David Stevens, Adam Millard, and Tom Lynch . With cover art by Lucas Korte, interior illustrations by Fufu Fruenwahl, and an introduction by editor Scott R Jones. The rock vibrates beneath the soles of your feet, and your headlamp flickers, fails. But then, you knew it would, eventually. This place is not for you, but here you are. CHTHONIC is here, now available for ordering by clicking here. I am very happy that CHTHONIC includes my true history of Lawrence of Arabia, Some Corner of a Dorset Field that is Forever Arabia, where it gets to hang out with cool tales by Ramsey Campbell and HP Lovecraft, amongst others. The thing was globular in the moonlight. Heavy breasted. Round haunches curving to a woman’s thighs that soon became dog’s legs. Or a jackal’s. And now you can see what that looks like! Very happy that my story in CHTHONIC has been graced with an illustration – you can see it in the Martian Migraine Press video, just click here. Don’t give her a kiss, you don’t know what she has been eating. 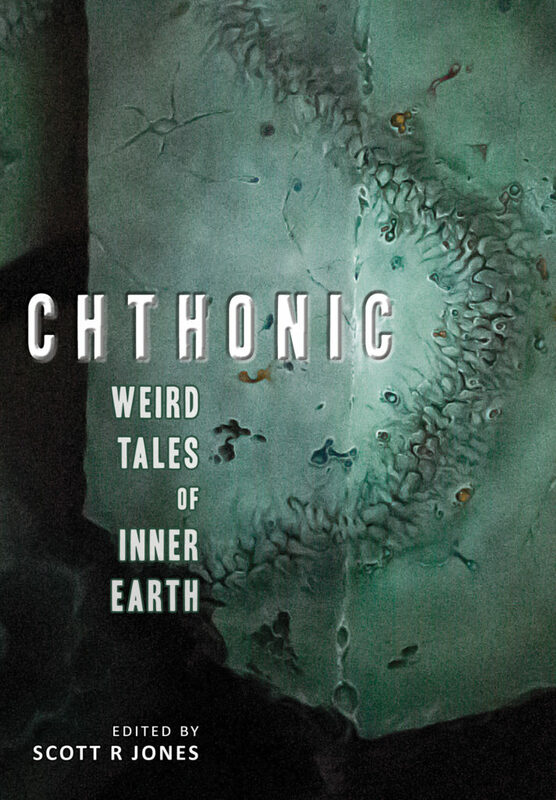 … with a new release date of February 20, there is only one week to wait for “Chthonic:Weird Tales of Inner Earth” from Martian Migraine Press. Am I going to miss an opportunity to say, hey, there’s me hanging out with Ramsey Campbell and HP Lovecraft? I don’t think so!